Separation distance is defined as the distance from the closest point of a Best Management Practice (BMP) to the particular feature being considered. Example recommended and REQUIRED separation distances for infiltration BMPs are shown in the figure to the right and are discussed below. Note that all REQUIRED statements in this section refer to requirements contained in the NPDES/SDS (CSW) General Permit (CGP). Vertical separation distance is the vertical distance from the bottom of a BMP to the top of the feature of concern. The shortest vertical distance is used in measuring the separation distance. Under the CGP, a three (3) foot vertical separation is REQUIRED between the bottom of any infiltration BMP and the top of seasonally saturated soils. Seasonally saturated soil is defined as the highest seasonal elevation in the soil that is evidenced by the presence of redoximorphic features or other parameters as assessed by a soils specialist. 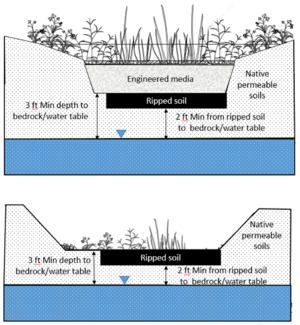 The temporary groundwater mound that develops below an operational infiltration BMP is not required to be a minimum of 3 feet below the bottom of the infiltration BMP. However, it is HIGHLY RECOMMENDED that this mound not penetrate into the infiltration BMP which could inhibit the pollutant removal within the media contained in the BMP. The base of the BMP may be raised to achieve the 3 foot separation. For more information on infiltration in areas with seasonally saturated soils, link here. Under the CGP a minimum 3 foot vertical separation is REQUIRED between the base of any constructed infiltration BMP and the top of the bedrock. The base of the BMP may be raised to achieve the 3 foot separation distance. For guidance on infiltration in areas with shallow bedrock, link here. Karst topography is a geological formation shaped by the dissolution of a layer, or layers, of soluble bedrock. Groundwater in karst regions is particularly vulnerable to contamination. There is also concern about the formation of sinkholes resulting from focused infiltration. The CGP prohibits infiltration within areas that are 1,000 feet up gradient or 100 feet down gradient of active karst terrain. In addition, the 3 foot minimum separation to bedrock is applicable under the CGP. Additional detail on identifying and testing for karst is detailed here. Horizontal separation distance is the horizontal distance from the closest point of a BMP to the feature of concern. The shortest horizontal distance is used in determining the separation. This distance does not include a mound that extends beyond the boundaries of the BMP. outside of an ERA within a DWSMA classified as having high or very high vulnerability, unless a regulated MS4 Permittee performed or approved a higher level of engineering review sufficient to provide a functioning treatment system and to prevent adverse impacts to groundwater. Maps of DWSMA areas are available through the MN Department of Health. A horizontal separation of 10 feet is HIGHLY RECOMMENDED between any infiltration BMP and a structural foundation. Designers are encouraged to model the groundwater flow in the area to ensure the infiltration BMP will not impact any surrounding structural foundations. Infiltration BMPs are not recommended if the infiltrating water contains a soluble pollutant that is likely to be transported via groundwater to a surface water impaired for that pollutant (e.g. chloride). Modeling may be useful for predicting the likelihood that infiltrated water will be discharged to a nearby surface water. There may also be local zoning or shoreline restrictions. Prior to the designing of any infiltration BMP that may impact surface waters, the user should consult the local city or county zoning office and watershed management organization, or the Soil and Water Conservation District. A 35 foot horizontal separation is recommended between any infiltration BMP and a septic tank or leach field. 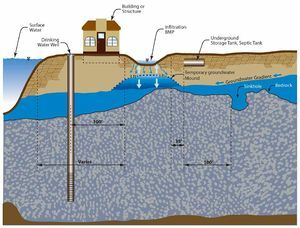 The CGP PROHIBITS infiltration when the infiltration system will be constructed in areas where high levels of contaminants in the soil or groundwater will be mobilized by the infiltrating water. At all other sites not regulated by the CGP, infiltration is not generally recommended in areas of contaminated soils for the same reason that the infiltrating water may mobilize the contamination. Stormwater infiltration may be feasible, however, on sites where the infiltration BMP can be isolated from the contaminants. It is HIGHLY RECOMMENDED that stormwater infiltration BMPs not be installed in areas with contaminated groundwater down-gradient of the BMP, unless barriers or other devices that maintain a separation between the water infiltrating from the BMP and the contaminants are present. More information regarding stormwater management in contaminated areas can be found here. Unless slope stability analyses demonstrate otherwise, it is HIGHLY RECOMMENDED that infiltration practices be located a minimum horizontal distance of 200 feet up-gradient from the toe of a slope that is greater than 20 percent, and that the slopes in contributing drainage areas be limited to 15 percent. Guidance for managing infiltration and runoff to minimize the likelihood of slope erosion and slumping has been developed by Toronto and Region Conservation and The University of Wisconsin Sea Grant Institute. Horizontal separation distances can be determined using simple measurement devices such as a GPS, survey, or even something as basic as a tape measure or measuring wheel. Distances should be measured from the edge of the BMP to the edge of the area of interest. Vertical separation distances require subsurface investigations. Information on determining the vertical distance to bedrock or groundwater can be found here. Required and recommended minimum vertical and horizontal separation distances. This represents the minimum distance from the infiltration practice to the structure of concern. If the structure is above-ground, the distance is measured from the edge of the BMP to the structure. If the structure is underground, the vertical separation distance represents the distance from the point of infiltration through the bottom of the system to the structure, while the horizontal separation (often called setback) distance is the shortest distance from the edge of the system to the structure. Contaminated soil/groundwater No specific distance. Infiltration must not mobilize contaminants.